Hear Ye, hear Ye! The annual EBHQ Show and Tell will occur on Monday evening, November 25, 2013, at the Unitarian Church of Kensington at 7:30, p.m. This event is the most attended meeting of the year, so come early to get a front row seat for a marvelous show of the work of our members. Following a brief general meeting and announcements, “As You Like It” will begin. The purpose of this event is to celebrate our members’ art by sharing in an informal, less stressful venue than a show. 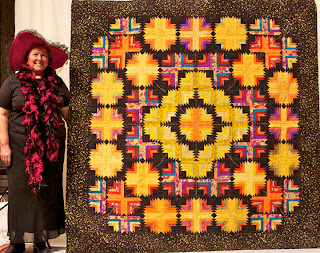 Each member is limited to two quilts made during the past year. For some members, it is difficult to choose, but for many who have never had the courage to get up in front of a group this could be an intimidating experience. Don’t worry! It’s low key, and fun and user friendly. When you apply to show, you will submit a few sentences about your work. All you have to do after that is stand next to your quilt at the event, pose for a photo, and your words will be read for you by the emcee. Quilts are then placed on the pews in the back of the sanctuary, so that they can be viewed after the event before you take them home. Easy as pie, as they say. The deadline for entries is Monday November 18. Limit yourself to 50 words. Follow the instructions on the application form and you’ll be all set. Bring your work to the meeting, get your instruction sheet at the door, and enjoy the show! Be prepared to ooh and aah, whether you are a participant with a quilt, or a participant as a viewer. This is a good time to bring family and friends. You might want to bring someone one who would be interested in becoming active with the guild. This event is not to be missed!